With direct deposit and pay cards as the preferred payment method, having an ATM on-site is an inexpensive benefit your employees will love! The average ATM surcharge in the U.S. is $3.50 and banks charge between $2.50 to $3.50 in "foreign ATM fees." Each time your employees use an ATM they are paying as much $7.00 to get cash... and they are using ATMs. Having a Surcharge-Free ATM on-site Saves Employees Thousands! One Texas company that employs 800 chose the Allpoint ATM option last year and has been able to save their staff $2,244 in ATM and bank fees a month on average. That's a savings of almost $27,000 a year! 79% of their employees receive surcharge-free use of the ATM, balance inquiries are always free and staff that do not do business with an Allpoint member financial institution pay less than the national average. The ATM experts at ATMatWork do it all. Just provide a space for the ATM and electricity. With more than 1,400 banks, credit unions and all the major paycard providers, your employees who have accounts with these financial institutions will receive fee-free access to the ATM. "We couldn't be happier with the attention and efficiency ATMatWork provides with our three Anderson Federal Credit Union branded ATMs. 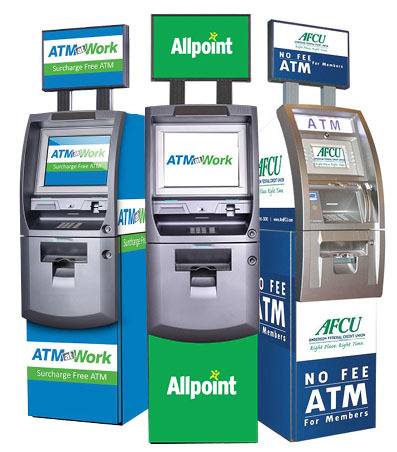 Our associates love having access to the No Fee ATMs with the added AFCU partnership and there is never any downtime with an of our ATMs. Thanks again and we would recommend you to anyone!" "One of the best tools ever for member acquisition." Michelin Tire employees no longer have to leave work to get cash for lunch or vending thanks to a new ATM in the break room branded by Upstate Federal Credit Union – owned and operated by ATMatWork. Best of all it’s surcharge-free for credit union members. It’s a partnership that works for Upstate FCU, Michelin Tires… and the employees.